I’m always looking for new, tasty recipes that can be made fairly quickly for week nights. I’m typically the first one home, and take on the cook role so we can eat at a reasonable time. In the past few years, I’ve culled together some solid recipes to choose from each night. I’ve used those tried and true recipes so much that dinner has gotten quite boring. In a move to revive dinners, Dan and I tried menu planning for the week. It’s kind of like an episode of Chopped every night, in that I won’t stop at the store for an ingredient or two. I’m of the “use what you have” mentality, which helps us keep our food budget in line and avoid throwing away food that’s spoiled. We had two large eggplants in our fridge. So, we searched eggplant recipes, trying to keep our mind toward healthy recipes. 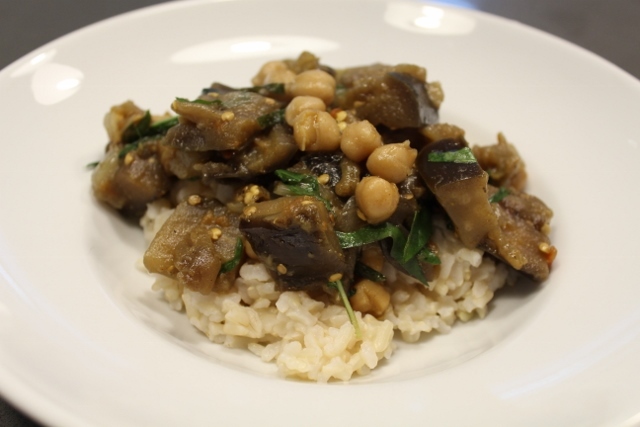 Dan found a recipe for Curry Eggplant. It came out to be quite tasty, but the cooking time took much longer than the recipe suggested. The recipe called for the eggplant/tomato/onion mixture to simmer for 12-15 minutes. After 15 minutes, there was still a lot of water in the pan. I ended up letting the pan simmer for almost 30 minutes. That was unexpected. Full disclosure: we didn’t have the full amount of tomatoes that the recipe called for, but I can’t imagine that caused the simmering issue. We also didn’t have any basamati rice in the house, so I used brown instead.I thought it worked well as a substitute. I would try this recipe again. It was easy to prepare, and I’ll be ready for a little bit longer of cooking time.